Figure 14. Convergence of locomotor characteristics between primates and the woolly opossum. 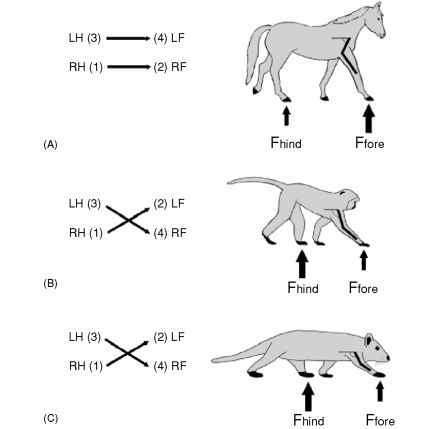 Compared to horses (A) and most other nonprimate mammals which rely on LS gaits (i.e., hindfoot touchdown is followed by ispilateral touchdown of the forefoot), primates (B) and woolly opossums (C) use DS walking gaits (i.e, hindfoot touchdown is followed by contralateral touchdown of the forefoot). When the forelimb strikes the ground during walking, the arm of horses (A) and most other mammals is more retracted (i.e., arm less than 90° relative to horizontal body axis), whereas that of primates and woolly opossums is more protracted (i.e., arm greater than 90° relative to horizontal body axis). At substrate contact, the forelimbs of horses (A) and other nonprimate mammals are characterized by higher Vpk forces relative to those of the hindlimbs. The reverse is true for most primates (B) and woolly opossums (C): the forelimbs are characterized by lower Vpk forces relative to those of the hindlimbs. Figure of the horse is adapted from Larson (1998) and that of the vervet monkey from Larson and Stern (1989). Animals are not drawn to scale. mammal studied to date that shows such close similarity in gait mechanics to primates (Schmitt and Lemelin, 2002). The significance of these findings for primate origins is profound. Our data support the notion that thin and flexible arboreal substrates were critical for the evolution of prehensile extremities and locomotor specializations in primates. 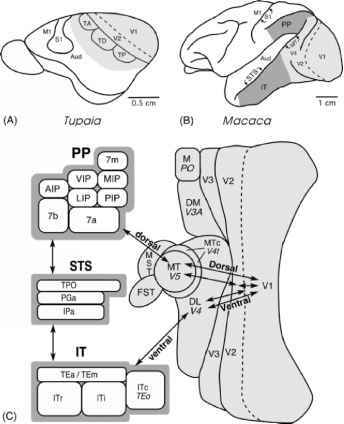 Both the visual predation model (Cartmill, 1972, 1974a,b) and the angiosperm coevolution model (Sussman, 1991, 1995) stressed the importance of vines or terminal branches for the evolution of grasping extremities in primates. This strongly suggests that the origins of grasping extremities and locomotor specializations in primates probably took place in ecological conditions not unlike those encountered by the woolly opossum. From the standpoint of positional adaptations, the last common ancestor of all primates was probably an adept quadruped capable of walking and climbing on thin branches, as well as some running, cantilevering, bridging, and upside-down hanging by the feet. While grasping a thin substrate with the feet, the hands were probably used often to manipulate fruits and capture insects, in a manner similar to Caluromys and cheirogaleids (Lemelin, 1996, 1999; Martin, 1972a,b, 1973). In a recent contribution, Szalay and Sargis (2001: 299) argued "... that didelphid arborealists are drastically unlike a variety of explosive arboreal grasp-leapers encountered among, and probably in the very ancestry, of the Euprimates, particularly Strepsirrhini." We concur with this characterization of didelphids, but disagree with the idea that the earliest primates were "explosive arboreal grasp-leapers". Our study shows that primate-like grasping morphology and locomotor mechanics are found in an arboreal didelphid for which leaping represents a small component of its locomotor repertoire (Charles-Dominique et al., 1981; Rasmussen, 1990). In other words, we believe that leaping did not play a major role in the origins of postcranial and locomotor features diagnostic of the order Primates. Although we agree completely with the idea that leaping was an important factor for the later diversification of primates, particularly strepsirrhines as pointed out by Szalay and Sargis (2001) (Szalay and Dagosto, 1988; Szalay et al., 1987), we think that leaping was not a critical component of the locomotor adaptations of the very first primates. The relevance of opossums as models for primate origins has been questioned recently by Sargis (2001). He argued that arboreal tree shrews (Tupaia minor and Ptilocercus lowii) may be better models because they are capable of grasping and are more closely related to primates. Sargis is correct in his assessment of grasping abilities of tree shrews, particularly Ptilocercus. However, Lemelin (1996, 1999) found that the hands and feet of woolly opossums are morphologically more similar to those of cheirogaleids than those of other didelphids. In addition, our performance data demonstrate the ability of Caluromys to walk and climb on very thin branches, a skill that is not evident in tupaiids whose locomotion has been studied on larger dowels (Jenkins, 1974; Sargis, 2001). Available kinematic data also indicate that Tupaia glis is more similar to other nonprimate mammals than primates. When walking, T. glis relies on a LS footfall pattern (Jenkins, 1974) and its forelimbs land with a less protracted arm posture (Fischer et al., 2002). Still, it is very possible that more arboreal tree shrews, especially Ptilocercus, would display more primate-like locomotor kinematics and kinetics. Sargis (2002a) showed morphological contrasts in the forelimb of more arboreal versus more terrestrial tupaiids very similar to those reported by Argot (2001) for didelphids. Unfortunately, the locomotor behavior of arboreal tupaiids, especially Ptilocercus, remains virtually unknown and an effort should be made, both in the field and the laboratory, to gather more data on these small mammals. Arguing that tree shrews are better models for primate origins solely because they are more closely related to primates negates the use of convergence as a tool to understand adaptation. If this reasoning were to be applied to the problem of whale origins, then an artiodactyl, such as a cow, would be the best model to understand the origins of cetacean swimming (Milinkovitch and Thewissen, 1997). Instead, the study of the kinematics and hydrodynamics of swimming in mammals unrelated to whales has led to a much better understanding of the problem of whale origins (Thewissen and Fish, 1997). The same rationale was used throughout this chapter in addressing the problem of primate origins.